September 16, 2016, 11:00 AM · However personal or intimate it may feel to play something like Brahms or Debussy, music is an experience in which we communicate with each other. It follows that string players must learn the gentle and complex art of leading each other. The motion of the upbeat, the overt, sudden facial gestures, and the shared feeling from one to another are all part of the choreography of leading and signaling. Unfortunately, giving the upbeat isn’t as easy as it looks. If your mind is on the music you played a moment ago, and not on the upbeat that’s about to happen, you won't have enough presence of mind to pull it off. Each intervening beat and musical thought matters. Fortunately, certain exercises can improve the technique and make the task of leading easier. 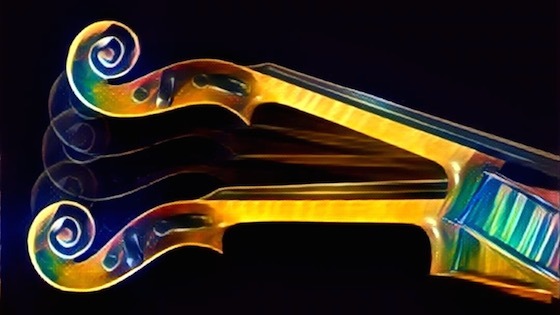 Because violin playing involves contrary motions of the right arm and the left fingers, and because the fluidity of music has a rather complex relationship with the beat and with a metronome, it’s no surprise that many string players find it difficult to give a pick-up. Knowing what the pick-up looks like gives the player an image to re-create. It starts the imagination. I remember seeing on youTube one of the concertmasters of the Berlin Philharmonic, who had the grace of a fireplug. He moved very quickly and simply, straight up and down, yet with the effectiveness of an assured, rhythmic machine. Leading has many faces, some beautiful, others strong and Neanderthal. It’s not necessary to look like Baryshnikov. Musical communication can be just as helpful with either approach. The other main ingredient for leading is that both arms need to move independently and inter-dependently. If they fight each other and adversely affect each other, the body will be too knotted up to effectively lead. Some awkward pick-ups don’t have enough height and drop. In other words, they barely move. Visualize how much space the pick-up needs to fill. To give it both the bounce and the height, imagine bouncing a basketball, with the floor at the level of your neck, and the highest point at your nose. The trajectory and physics of bouncing a basketball remarkably resemble a musical pick-up. The continuum of the beats completing their full pulse, one after another, and the speed and inevitability with which they operate, find their counterparts in the bouncing of balls and jumping on a trampoline. If the speed of the pick-up is exaggerated or stilted, it helps to understand that the appearance and speed of the pick-up isn’t an exact replication of the speed of the music itself. The pick-up may look much faster, or much slower than the music. If the player shows a super fast, overly excited signal, he’s making the understandable mistake of over-reacting to the exciting, fast music. This is a good example of something that happens often in music: following one’s intuition. Music has a way of tricking the mind. It’s often better to be counter-intuitive. Here’s an exercise to help the player appreciate the various ways one beat can be interpreted: With the pulse in mind, move the arm as if you’re conducting. Make the movement as smooth as possible, with the perfect trajectory of a rainbow. With the exact same pulse, now begin the movement faster to indicate a louder dynamic, and then finish the movement with a slower gesture. Try the same thing with the bow. You’ll see how fast bow movements and slow beats go very well together. It’s part of the vivid, rich language of rhythm, and it nicely illustrates one of the more exciting and interesting aspects of music. Of course, such movement-time relativity can be frustrating while learning it for the first time, but when it’s mastered it makes it easier to lead. Quickly lifting the violin and dropping it back down does not seem so awkward anymore when you know that fast movements and slow music can go together. Upbeats can travel in a myriad of directions, but they’re still merely tightly packaged pendulums. In the hands of former Chicago Symphony maestro Fritz Reiner, each was a tiny flick of the baton accompanied by a controlled stare, which left little doubt as to where the beat was. No matter what the beat looks like, it has to have three crucial components. There is a moment before the bottom of the beat happens, a time for the mind to focus on when the pulse will reach its moment of impact, its destination. Known as the pulse prep, its absence leads to a continuum of rushing. The top of the beat has a momentary lull, or transition, which allows the movement to change direction and get ready for the next beat. The actual impact of the beat should be felt, either subtly as in Pierre Boulez’s style, or architecturally robust as in Georg Solti’s. As the music is internalized, and as the player feels comfortable with the construction and emotion of each pulse and measure, she will feel free enough to look at her chamber music partners. Facial gestures are helpful in conveying the narrative of the phrase. Pickups gestures are not only necessary, but help to convey the moments when everyone needs to feel they are on the same page. Together, glances and beats hold a group together. Knowing what each player has in her part helps, but only up to a point. Composers know what’s in the music, and have a knack for seeing the score as a whole. On the other hand, performers don’t have the skill of remembering who has what, but are still responsible for making all the parts work together. Giving each player the assurance that it is her time to play, to make a dynamic change, and to slow down or speed up, is the job of the leader. The partners, in turn, know when and what to do to make the interpretation come alive. September 18, 2016 at 05:44 PM · Very helpful article! As second violinist in a quartet, I assume that I should lead when the first violinist is not playing. Is that correct? September 19, 2016 at 03:06 AM · "pulse prep" ... I like it. I'm helping my daughter (and soon, a group of her friends) with a Telemann concerto for 4 violins. Not difficult music, but wow, does precision ever count in this type of music. But overall, my thinking is, nothing that experience and good coaching can't overcome. September 19, 2016 at 04:33 AM · Who leads when the first violinist isn't playing? There's a definite hierarchy that I think exists, even though I've never seen it written down. Second violin is next in line, followed by viola, and then guess who? Since most string quartets are groups of pleasant friends, we hope, everyone seems agreeable to follow one of the few unwritten rules that exist in music. That being said, on many occasions a second violinist has abdicated his or her role to the violist or cellist. It's a lot of trouble to lead, and second fiddles would rather enjoy the music than take the risk of bringing in someone incorrectly. Paul, second violinist for the last 40 years.